Sisters April, May, and June have had a bit of a rough year. When their parents decided to get a divorce, May had an embarrassing breakdown that prompted their mother to move the girls to a new town, and their father took off for Houston, far away from their California home. Left with a lot of pent-up emotions and frustration, the girls start their first day at their new school...only to discover that they are in possession of some pretty extraordinary gifts. April can see the future, May can become invisible, June can hear thoughts, and each sister has her own idea on how these powers should be used. But then April foresees something vague and frightening, and they'll have to work through their differences and issues in order to save each other. 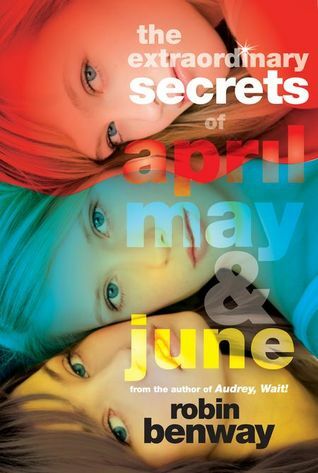 The Extraordinary Secrets of April, May, and June has all the same sharp, smart humor that made Robin Benway's first book so likable! This story alternates from the points of view of each of the three sisters, giving the reader a feel for each of their different personalities and allowing you to see the story from many different perspective. You also get to see each girls' own issues and drama as they unfold: April grapples with unexpected feelings for a guy and her own protective nature when she foresees some pretty scary things, May struggles with constantly feeling invisible and her disappointment in the way her father keeps brushing her off, and June wants to be popular and well-liked at school, but wishes her sisters would just leave her alone. Despite the supernatural powers the girls possess, everything about this book is so realistic, from the constant upheaval of emotion to the bickering and humor and love. And each girl's issues and the ever-shifting point-of-view aren't the only things that keep this book intricate; Benway was woven in a long and complex chain of events that take the girls up and down, and teaches them that each experience has its own importance, to learn from mistakes, deal with each other, and to stick together when life gets rough. By the end of the book, you won't want to let go of April, May, and June. Cover Comments: I love the bright colors! The way the photo of the girls is arranged, sideways, with the different colors descending down the cover, is a really neat effect, and makes this cover stand out. I love it. The Extraordinary Secrets of April, May, and June will be released on August 3rd, 2010. Special Announcement from Cassandra Clare! Mockingjay 13 District Blog Tour!